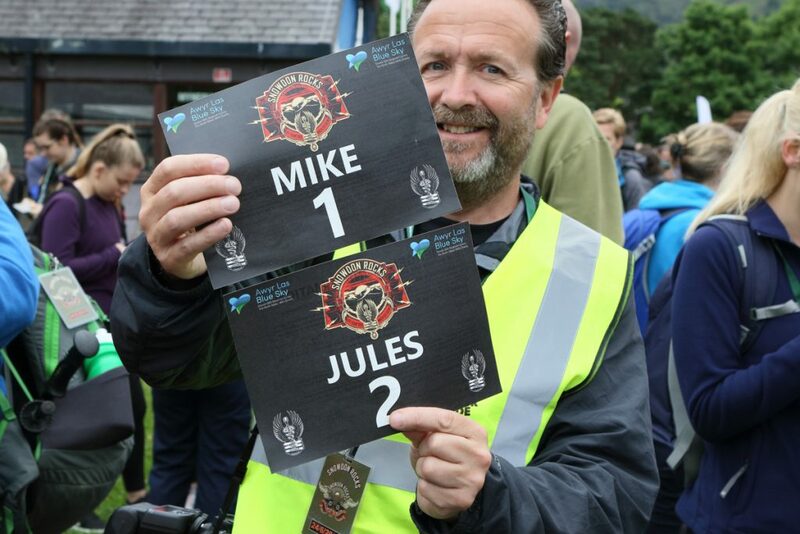 The eleventh annual climb to the summit of Mount Snowdon began with a morning registration at the Electric Mountain in Llanberis. 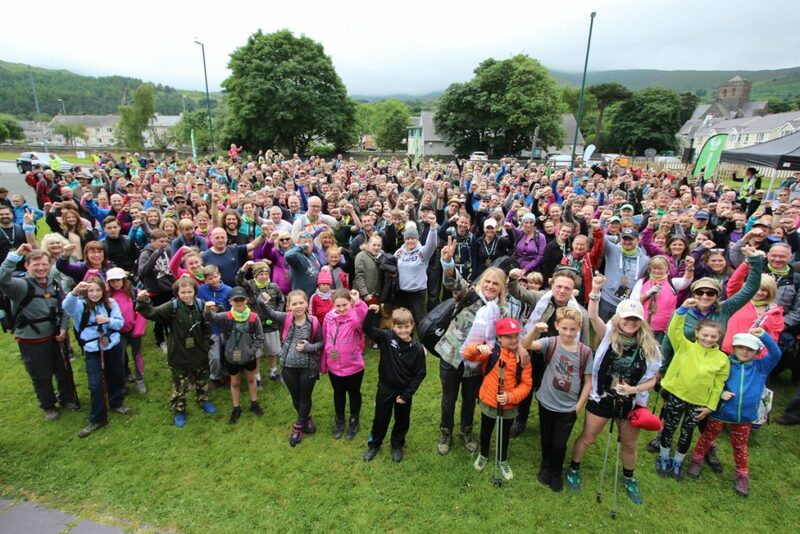 This year, the By Your Side Walk across Wales that was led by Mike and Jules Peters, was a fantastic success, engaging with the entire community of North Wales and resulting in over 650+ people signing up (plus volunteers) for the final day’s hike to the summit. It was a magnificent sight to see so many people from all over the UK and Europe assembled for the speeches and announcements. Music was provided by the community group Ghostbuskers who helped to create a carnival atmosphere with sing and strum versions of James’ alternative music anthem Sit Down and the Nancy Sinatra classic ‘These Boots Are Made For Walkin’. 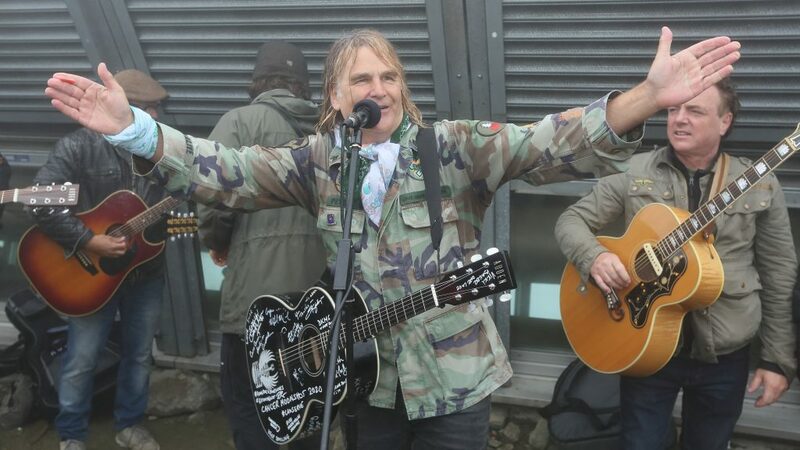 A rousing cheer greeted Mike Peters’ appearance on the bandstand and flanked by Jules, Mike delivered an emotional speech thanking the NHS staff for saving the life of his wife and playing a version of ‘Forever By Your Side’ that brought tears to many eyes. 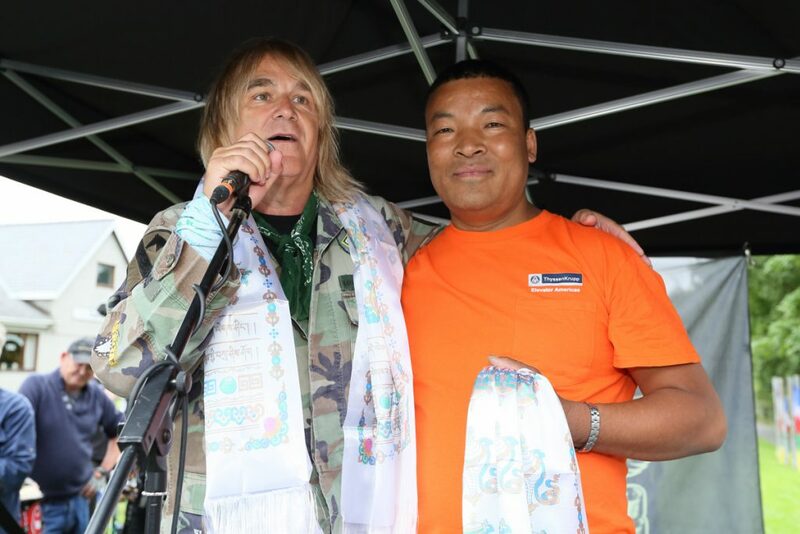 Pemba Sherpa from Kathmandu, came on stage to present Mike and Jules with Nepalese ceremonial scarves in recognition of the work Love Hope Strength has done in support of cancer and relief services in the kingdom of Nepal. Namaste – I bow to the divine in you, seemed a perfect way to pay respects to the spirits of the mountain that is Snowdon and to the familiar sounds of a brass band hundreds and hundreds of trekkers set off for the mountain. The weather was holding up. Comfortably dry and cool… perfect hiking conditions. The first stop was at 570 metres at the Halfway House Cafe where a mobile PA system was set up for the band of guitarists and mandolin players (who had all carried their instruments so as to perform alongside Mike). Once everyone had made it to this rendezvous point the familiar chord pattern of ‘One Guitar’ sounded in the Cwm and voices were raised in celebration. The familiar refrain of ‘Wonderwall’ followed along with stirring versions of ‘In A Big Country’ and a campfire singalong to ‘Sixty Eight Guns’. This impromptu festival of remembrance was made even more reverential when Mike Peters asked for those who had come in honour of someone to raise their hand. It was an emotional sight as the silence that followed was impeccably observed and powerfully felt by all. ‘Knocking On Heaven’s’ door broke the silence with grace and after the second chorus, Mike Peters encouraged everyone to shout out the name of the person they had come to remember. 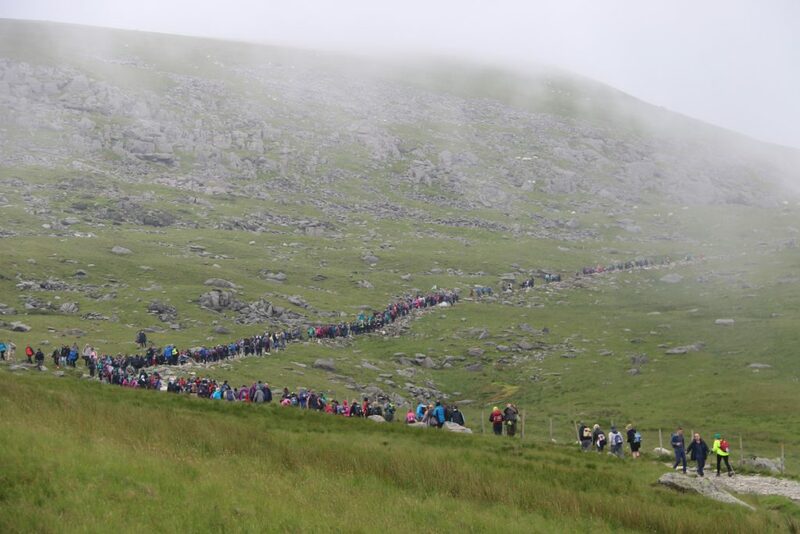 It was time for the final push to the summit, and soon the enormous line of Love Hope and Strength people that stretched across the mountain paths, could be seen to disappear into the cloud base that had gathered upon the highest reaches of Yr Wyddfa. The summit was crowded like never before, as Mike and the band of brothers launched into song. ‘Rocking In The Freeworld’ was literally rocking the mountain and even more people from other hikes and other paths to the summit joined the swelling crowd that had engulfed the trig point. Laughter greeted the now traditional Christmas singalong as Mike led the way with ‘Happy Xmas [War Is Over]. The arrival of passengers from the special trains carrying cancer patients and families prompted an outbreak of ‘This Train Is Bound For Glory’. Mike was joined by his Alarm band mate – James Stevenson and off they went into the classic ‘Get Down and Get With It’ which had every clapping hands and stamping feet along with Slade fanatic and well known TV Presenter Gareth ‘Gaz Top’ Jones who could be seen singing at the top of his voice at the top of the mountain. 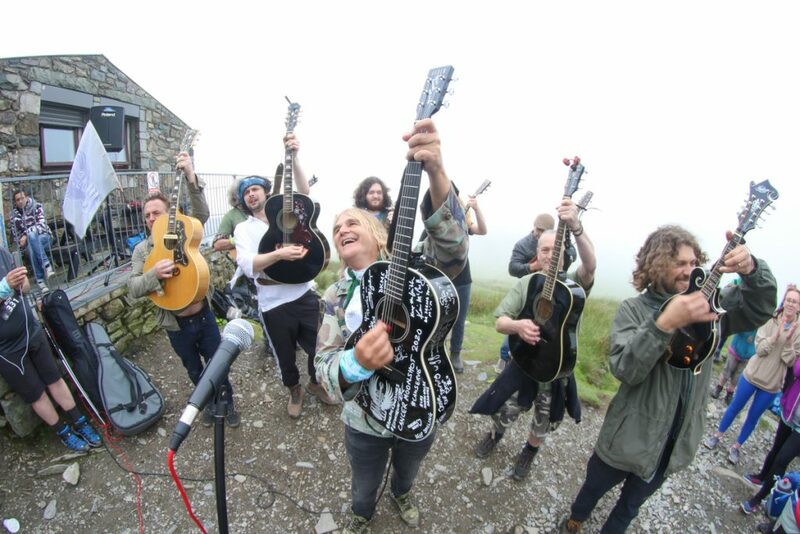 The ever popular South Wales artist and Snowdon Rocks’ favourite – Chris Summerill was encouraged to perform the Oasis song ‘Don’t Look Back in Anger’ – made poignant by recent events, and the melody and words were sung by everyone stood at the highest point in all of Wales and England. The reverend Wynne Roberts a.k.a. the singing chaplain and Elvis Presley lookalike, joined in after escorting the patients on the train and a rocking version of ‘Hound Dog’ was followed by ‘Blood Brothers’ actor Sean Jones encouraging the crowd to sing the ‘Ooh Ooh’ backing vocals of ‘The Wonder Of You’. The concert finished on the words of ‘Love Hope and Strength’ and the descent back into the valley below. It had been a long day and at sea level (well almost), every returning hiker was greeted with a welcome bowl of hot soup and fresh bread at the Pen Y Ceunant, generously provided and served by the gracious and always smiling Steffan. It was soon time to peel off the climbing boots and put on the dancing shoes as the Gwyl Snowdon Rocks Festival (set in the grounds of the Heights Hotel), kicked off with a high energy set from Welsh Rebel Outpost who were joined by Mike Peters for their final song – the Rich Kids classic ‘Ghosts of Princes in Towers’. Mike & Jules Peters’ youngest son Evan (aged 10), then made his live debut as a singing drummer in his new Welsh group ‘The Bandanas’, bringing the house down with a dual version of Feeder’s ‘Buck Rodgers’. Next up was OCD, which featured the couple’s oldest son ‘Dylan (aged 13), on lead guitar. OCD performed a cover and two originals before kicking out the jams with a rollicking version of The Cult’s ‘She Sells Sanctuary’. 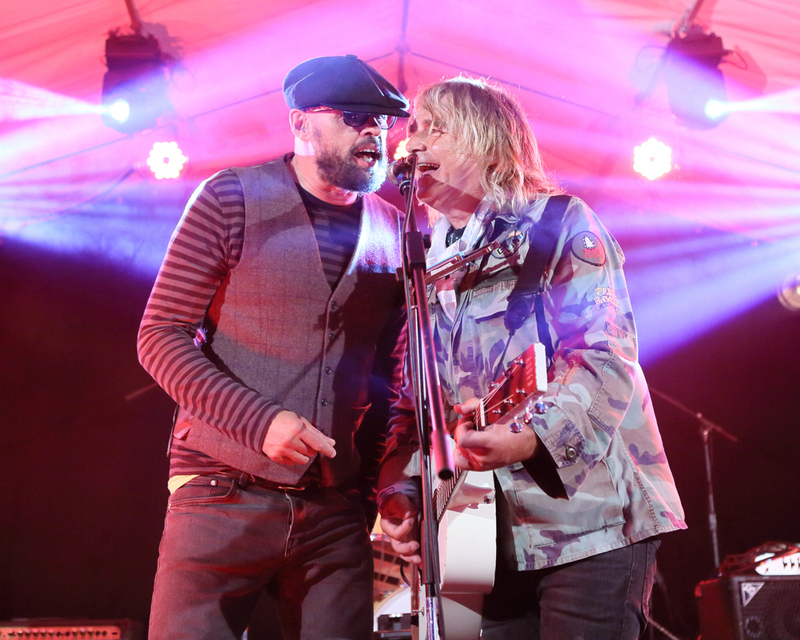 The stage was set and Gareth ‘Gaz Top’ Jones introduced Mike Peters who entered from stage left to a hero’s welcome. A thunderous set was blasted out, beginning with Alarm classics ‘Marching On’ and ‘Where Were You Hiding?’ complete with mass playing-card throwing. ‘Strength’ came next and the acoustic /electric and coupled with stomping bass drum amplified power in Mike’s voice as the atmosphere was ramped up even higher. As if on cue, ‘Rain In The Summerime’ even featured a 2 minute light shower of rain drops which was the only time the heavens had opened throughout the day. A rousing finale speech from Mike was followed by a hymn-like reading of ‘Forever By Your Side’. The words and melody of ‘Spirit Of ’76’ filled the air and Mike was joined by James Stevenson and Chris Summerill on second guitar and Mandolin. From here on in, it was anthems all the way. As the sun went down into the West, ‘Sixty Eight Guns Will Never Die’ was massive and the sixty minute set was closed with ‘One Guitar’ and over 1500 voices taking up the chorus including a guest appearance by Gary Christian of ‘The Christians’. The atmosphere was special in the way that only festivals like this can create. 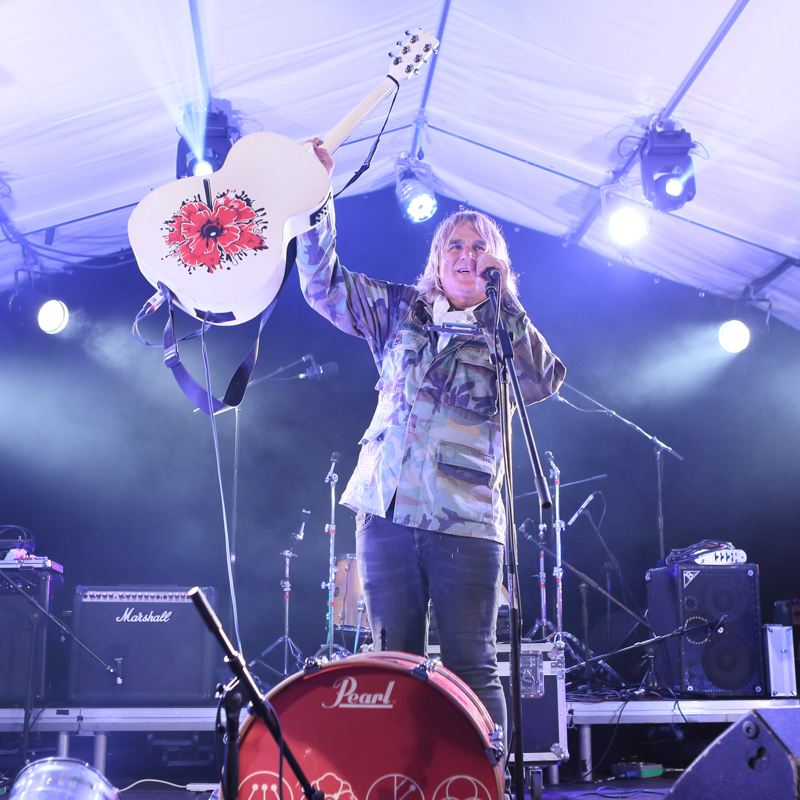 A unifying experience on the mountain-side, coupled with the joy of music is unique to Snowdon Rocks, making it a festival unlike any other in the UK. ‘The Christians’ brought their own brand of vocally driven acoustic music into this atmosphere and were greeted warmly by all. The band tapped into the zeitgeist and engaged with everyone in a smooth and intimate manner that was perfect under the moonlight. 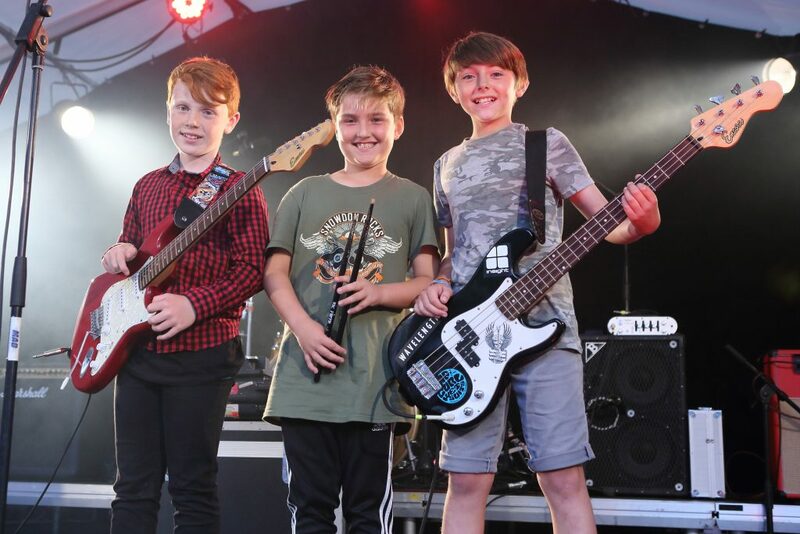 ‘Forgotten Town’ and a superb ‘Harvest For The World’ were just two of the song performances that helped to make this year’s Snowdon Rocks an unforgettable experience for all who attended. 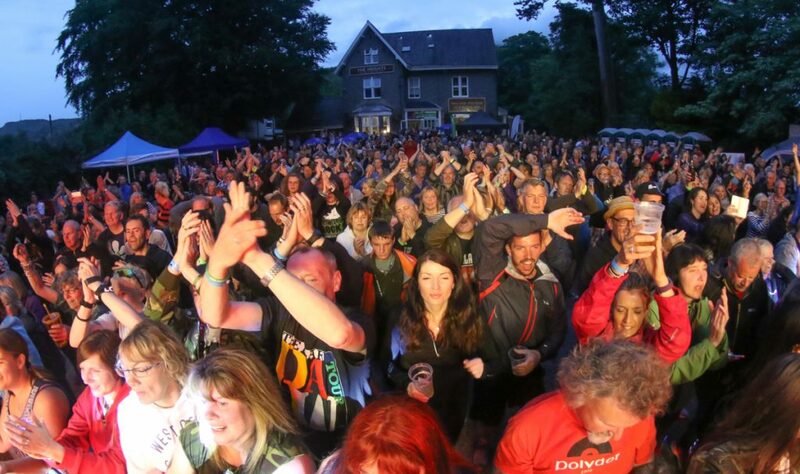 Snowdon Rocks 2018 will take place next year on Midsummer’s Day June 23rd. A comprehensive set of photos from the whole walk and Snowdon Rocks will be published in the next few days.